A large part of our game is climbing and we weren’t using it as much as we should have. With the pre-alpha build you saw that we could climb man-made objects. 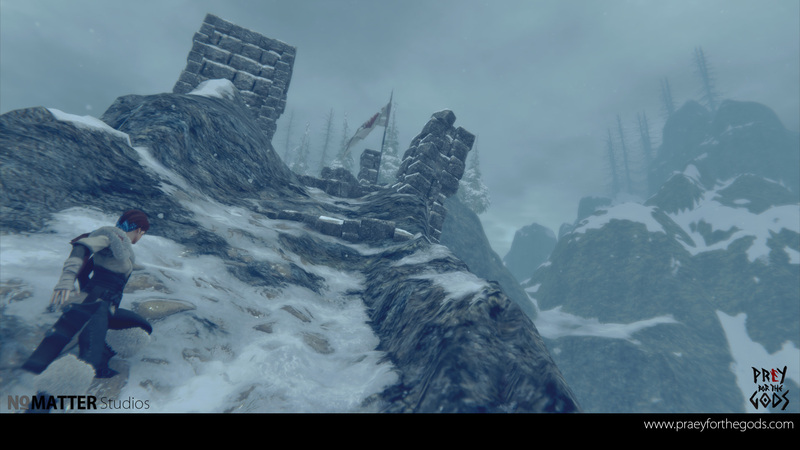 These are simple "prefabs" in Unity, just like our simple rocks. In that build, we made a conscious effort to not make any of the rocks climbable. We wanted to make them all eventually climbable but didn’t have the time to account for players getting lost or stuck on them. It was an early build and we knew we’d get back to that question. Then we ripped the band-aid off and just set all terrain to “climb”. Currently, it means the player can climb the ground (we’ll fix that)...but overall it's awesome! The night we set it up, Tim and I were working until 3 am and I lept off a cliff and in mid-air, pulled out the grappling hook, fired it off at a random cliff wall and BOOM MAGIC TOTALLY AWESOME. The freedom and the overall sense of exploration went through the roof. That, coupled with the improvement to the overall scale, really felt epic. We also added something on top of that which is what we’d been wanting to do for a while; Tim has been begging to add one since the Kickstarter but I was worried it would break bosses or make them too easy. It actually does the opposite and it makes the combat way more awesome and epic. Also, you now have a much more strategic choice to climb up and then try to leap to a boss with a little more range. It also opens up a ton of options for us with world building. So yea, we implemented a parachute/sailcloth/glider thing! This is something we’ve found makes the game and world come alive. With our storms you can quickly get into trouble as you think you are safe but the wind gusts will push you around and cost you precious stamina, and could also push you into harm. If you are lucky you can use your grapple hook with it and overall movement in the game feels insanely fun and freeing. That being said the game isn’t easy now because of it. (We actually die more!) But, our more frequent deaths are now based more on our choices to push ourselves, which we really find to be so much fun and a big part of how we want people to play. Currently, we’re thinking you’ll start with a pretty basic glider and perhaps find better ones in the game that are easier to control in the wind. Chien also implemented save and load and this is obviously really a big part of the game. Having this in now lets us start working on pacing and refining the core loop more. Currently, to save, you’ll enter into any cave and the game will save automatically. We’ve also made some adjustments to the caves. If you remember in the pre-alpha build the player would enter a cave but the camera would lock you into a seat. It was a little jarring and we wanted the player to have more range of motion while inside to explore the caves and move around them, searching for clues on the walls. 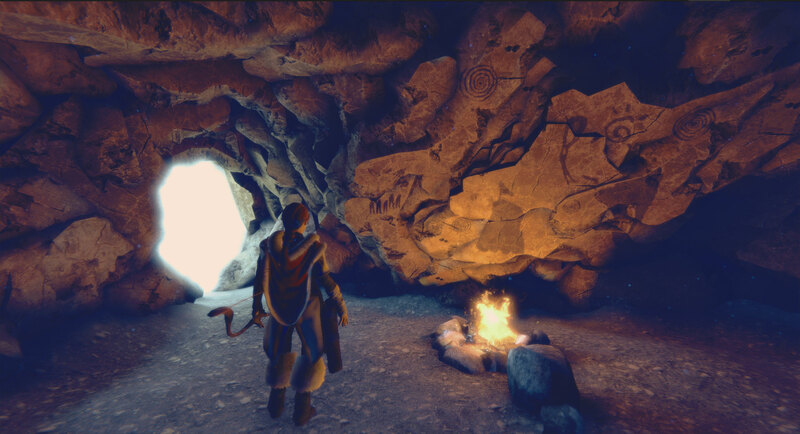 This also allowed us to refine the UI so that it was a single system across both caves and the open world. Our terrain tools are so much better now, thank you Tim! Tim updated these tools so we can now build ramps with knowing the % incline and tilt (30% is like the magic number of awesome). You can create your own ramp shapes which can also be expanded with rock objects and our stamping tool. Now we can make above ground areas much faster, with angles we know will provide better visuals and gameplay versus just eyeballing ramps. We also did a major rework on the combat with the player and our minions, really going into the animations to tune attacks. We still plan to work on it further but what we done so far is a big improvement. We also added a new type of enemy/mini-boss that you can fight. Champions were the first addition that we mentioned in the last newsletter and that’s proving to be a lot of fun. However, there is something new we spun up over a quick chat about getting new large monster types in quickly. So I sketched it up based on an image I had in my head: It’s a living tower boss that you can fight. It’s showing to be pretty successful in helping with POI and allowing the player to play with boss-like combat (climbing and killing) versus more ground/bow combat. We’re still working on them and won’t show this yet to prevent spoilers for some fans. Sorry! We added bedrolls! You now can sleep anywhere outside. Obviously, caves prove the best option as you won’t get hit with cold damage, and you'll regain the most strength/stats. You can’t sleep during combat and if you find an outpost you’ll get some resistance to the cold when you sleep versus sleeping directly in the snow. We added maps from fallen heroes that the player will find. 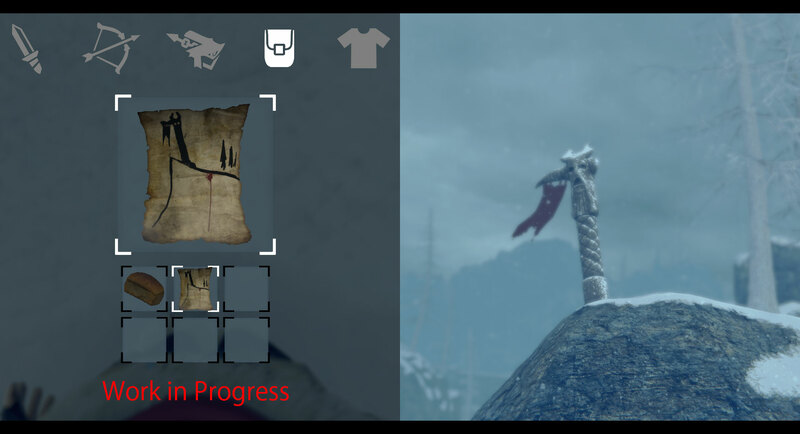 We’re thinking they’ll have crude images sketched out on torn parchment that will hint to the player where items or unique story items could be located. If you can find the location you’ll be rewarded with something. It’s a great way for players to engage in additional story or find better items to aid them as they gear up to take on bosses. We’ve been refining player controls and we felt getting those to feel really responsive is a huge improvement. Also we've added new run, sprint, jump, attack, and swimming animations and refined controls. Picking up items is faster, too, as well as retooling our controls with climbing and falling. The bow aiming and firing has also been improved so that it feels right. 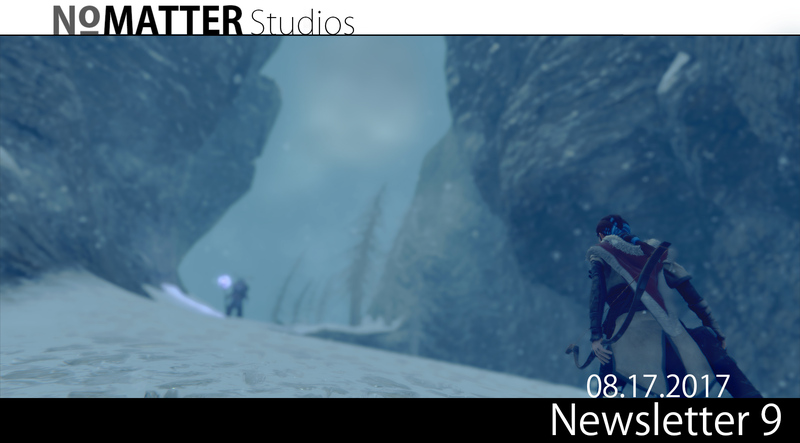 These improvements coupled with the new controls have us very happy with where the game is going! Development is in a great spot right now. As tools are working and tech is polished which allows us to think of ways to push the tech and get even more out of our game. We’re still working towards our Closed Alpha. We have a playthrough that we’re refining and hope to have in players' hands soon. The third boss is being worked on as well and we’ve played a prototype of our 4th/5th bosses which were very promising. Sort of. We are close enough to PAX that we'll be there checking it out. However, we won't be demoing anything officially. However, we will be helping demo Joe Mirabello's game, MotherGunShip, in the Indie MegaBooth. Joe and I worked together years ago and have stayed friends since then. He made Tower of Guns and was super cool and sponsored our Kickstarter with free copies of ToG, so this is the least we could do! We'll also be wandering around PAX and wearing some prototype PftG t-shirts and passing out PftG buttons.